Looking to make some tasty foods using dates?, then you should try this. Dates are rich in Iron and they also provide a wide range of essential nutrients, and are a very good source of dietary potassium. The sugar content of ripe dates is about 80% and the remainder consists of protein, fiber, and trace elements. Similarly laddus are also a tasty and good south indian food. When you combine dates with Laddu’s the duo tastes better. Grind the finely chopped dates into a fine paste and keep it in a bowl. In a pan, add ghee and the dates paste. Fry it for some time. Add Khova, coconut, sugar to the pan and saute in a low flame. Add cardamom powder and almonds. Keep saute. Keep on stirring until the paste gets separated from the sides of the pan. Transfer it into a tray and let it cool. Make small balls of Laddu’s when the mixture gets cooled. In a flat dish add sesame seeds or grinded conconut and roll the laddu over it to get it decorated. Adding a little Cashew too to the preparation will make it more tasty. 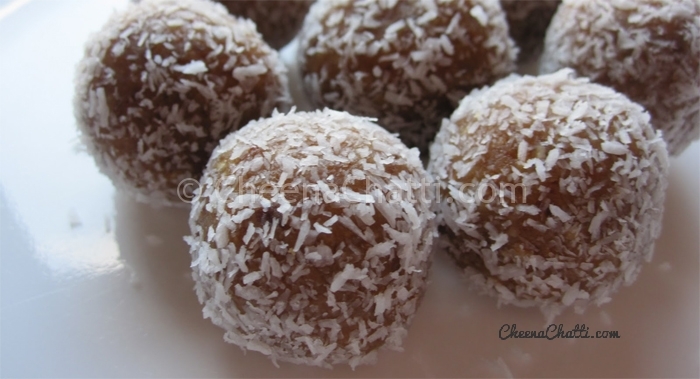 This entry was added on March 29th, 2013 by Cini P Moideen in Bakery and tagged with how to make laddus, evening snack, laddu with dates, dates laddu, laddu, arabian laddus, tasty laddus, dates. Last revised on April 4th, 2018. Recipe & Recipe photo contributed by Sherly James.